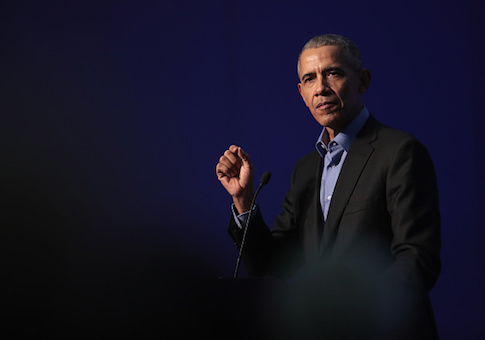 Former President Barack Obama has been secretly holding meetings with multiple potential 2020 Democratic presidential candidates. Obama has so far met with at least nine possible candidates at his office in the World Wildlife Fund building in Washington, D.C., Politico reports. The meetings have been at Obama’s personal office on the third floor of the World Wildlife Fund building in D.C.’s West End neighborhood, and they show how a stream of ambitious, searching politicians are looking for guidance and support from the man who has remained the reluctant leader of the Democratic Party, eager to be involved, though not directly. He's not making any promises of support, though, and is not expected to endorse in the 2020 race until after a nominee has emerged. Among those Obama has met with in Washington, D.C. are Sens. Bernie Sanders (I., Vt.) and Elizabeth Warren (D., Mass. ), former Massachusetts Gov. Deval Patrick (D.), and his former vice president, Joe Biden. Other Democrats who have had recent meetings with Obama outside his office include Los Angeles Mayor Eric Garcetti; former Missouri Secretary of State and failed Senate candidate Jason Kander; former South Bend, Indiana Mayor Pete Buttigieg; and former New Orleans Mayor Mitch Landrieu. Obama has also met with his former attorney general, Eric Holder, who may be considering his own run for president and is now working with the National Democratic Redistricting Committee. Since Republicans won the White House and retained control of both houses, many Democrats have struggled to point to a leader in the Democratic Party, and some continue to point to Obama. Obama for his part "doesn’t see himself as the person to come up with the plan, people who know about the meetings say, but he is eager to be a sounding board and counselor to the Democrats he sees as playing a role in shaping the party’s future," according to Politico. The potential large field of Democratic candidates running for the party's nomination to challenge Trump in 2020 has caused turmoil and begun to pit different factions of the Democratic Party against one another. A vocal portion of the party has pushed it in a more liberal direction, while some others wish to take a more moderate stance. Senate Minority Leader Sen. Chuck Schumer (D., N.Y.) has urged Obama to help Democrats during the 2018 midterm elections with fundraising. This entry was posted in Politics and tagged 2020 Election, Barack Obama, Democratic Party. Bookmark the permalink.